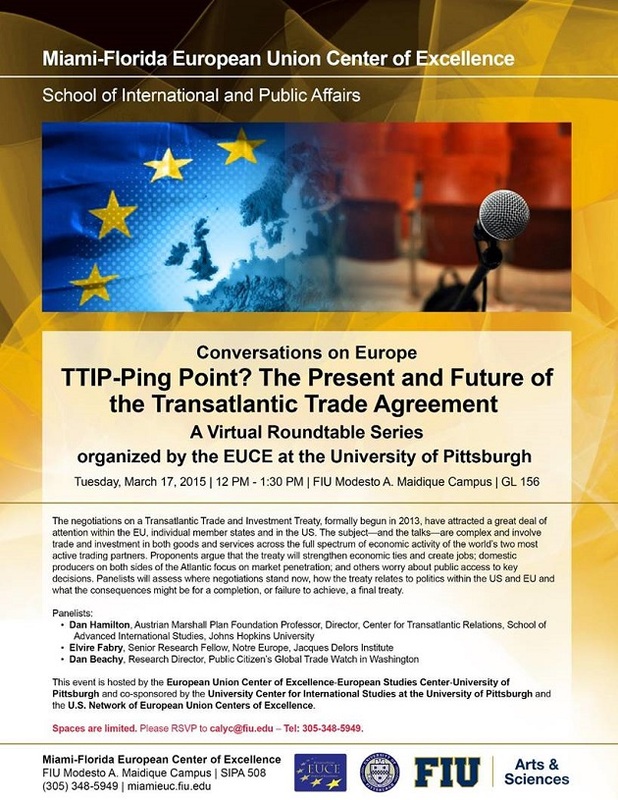 MEUCE Conversations on Europe: "TTIP-Ping Point? The Present and future of the Transatlantic Trade Agreement"
The negotiations on a Transatlantic Trade and Investment Treaty, formally begun in 2013, have attracted a great deal of attention within the EU, individual member states and in the US. The subject—and the talks—are complex and involve trade and investment in both goods and services across the full spectrum of economic activity of the world’s two most active trading partners. Proponents argue that the treaty will strengthen economic ties and create jobs; domestic producers on both sides of the Atlantic focus on market penetration; and others worry about public access to key decisions. Panelists will assess where negotiations stand now, how the treaty relates to politics within the US and EU and what the consequences might be for a completion, or failure to achieve, a final treaty.